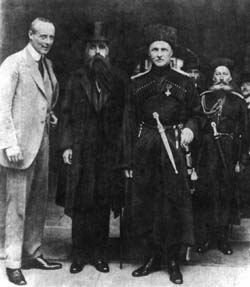 PAVLO SKOROPADSKY (CENTER) WITH FOREIGN DIPLOMATS IN 1918. Hetman Pavlo Skoropadsky’s grandson Borys D. Skoropadsky has returned to Ukraine with his family to restore the historic truth about the second Hetman State. The Skoropadsky family history dates back more than seven centuries. This old Cossack family is descended from Ukraine’s two oldest dynasties, and Borys’s ancestors include Constantine IX Monomachos and Grand Duke of Lithuania Gediminas. Among Ukraine’s other hetmans were Pavlo Skoropadsky’s great- grandfather Ivan Skoropadsky (1708-22), grandson of the famed Fedir Skoropadsky, who fought in Bohdan Khmelnytsky’s army and died a hero’s death during the Battle of Zhovti Vody. Pavlo Petrovych Skoropadsky was born in 1873 and raised in the true Cossack spirit, learning to respect Ukrainian culture and traditions. He graduated from the most elite educational establishment in imperial Russia, the St. Petersburg Page Corps. During the First World War he commanded a regiment of the elite Life Guards, then a cavalry division, and later an army corps, becoming Russia’s youngest general. The life of his grandson Borys Skoropadsky took such a course that he learned about his grandfather only in Canada, in 1999, because his mother had concealed the truth from him. He was born in Canada in 1956 and spent 50 years there. His father Danylo was poisoned on Feb. 22, 1957, and died the next day in London. His son Borys was 10 months old. Borys Skoropadsky’s mother Oleksandra was aware of the threat to her son’s life. Trying to protect him, she registered him under her mother’s surname, Tuhaibei, which he kept for 44 years. Borys was raised by his mother and his uncle, Colonel Porfyrii Sylenko, who was like grandfather to him and served as his male role model. Sylenko had served with Pavlo Skoropadsky and later, in London, was Danylo Skoropadsky’s personal secretary and consultant. As the only surviving relative of Borys’s mother, on who he had a strong influence, Sylenko insisted on hiding Danylo Skoropadsky’s son after settling in Toronto on a permanent basis. Sylenko meant to tell Borys the truth after he grew up. He had no time, however, because he died when Borys was 22, and his mother did not dare tell him for a long time. Years passed, and she continued waiting for an opportunate moment. Meanwhile, Borys tried to find himself: he lived in England, California, and Florida. He took up various projects, including starting his own business. He was a car dealer and real estate agent, and even designed residential construction projects. When he first visited Germany at the age of 17 years, he realized that he was being drawn to this land by some magnetic force. Later he discovered that his grandfather Pavlo Skoropadsky was buried there. After flying to London when he was 22, he felt another surge of energy pierce his body, which made his hair stand on end. His father Danylo Skoropadsky was buried in London. Nothing like that happened when he visited France and other countries. Years later the same thing happened for the third time, and the impact was considerably stronger. It happened in Ukraine. Borys has two sons: eight-year-old Danylo (named after his grandfather whom he resembles) and six-year-old Maksym. Both are devout hockey players. According to Skoropadsky (and history confirms his story), in 1938 Hetman Pavlo Skoropadsky officially made his son Danylo Skoropadsky hetmanych, his successor, who would become hetman after his father’s death. When this happened, however, the hetman powers went to Pavlo Skoropadsky’s eldest sister Maria. She died three years later, in 1959, whereupon Yelyzaveta took over. She died in 1976, and Pavlo Skoropadsky’s youngest daughter, Olena Ott-Skoropadsky, refused to have anything to do with the succession issue, announcing that she wanted to stay out of politics. She was the youngest of the family and had none of the political experience of Skoropadsky’s older children. We know that a hetman organization created by Pavlo Skoropadsky functioned in the Ukrainian Diaspora, whose membership was topped only by the Communist Party. Its strongest and most effective organizations operated in the US, Canada, Germany, and Great Britain, where many Ukrainians live. The US government even gave Ukrainian-American hetman- affiliated war pilots aircraft with names like Kyiv, Odesa, and Lviv. The hetmanites had weapons, uniforms, and training camps. In time, however, the hetman movement began to decline, and fewer books were published about Skoropadsky whose name began to sink into oblivion. You launched your quest in Canada and now you are here in Ukraine. What is the purpose of your resettlement? You have been here for more than a month and not returned. How do you feel in Ukraine? Pavlo Skoropadsky: I feel great. I will live in Ukraine for the sake of Ukraine. Do you know much about your grandfather? Pavlo Skoropadsky: Pavlo Skoropadsky was a career army officer in tsarist Russia. In his childhood he studied in Greece and Italy and then traveled far and wide. He lost his father when he was 12. He studied a lot and worked hard to improve himself; he became the youngest general in the tsarist army. He wanted to be in the front ranks during the war. His men fought better because their commander was always nearby. Do you know what kind of character he had? Pavlo Skoropadsky: I read a memoir. One evening his colleagues visited him at home. The apartment had three rooms where people gathered. His wife Oleksandra was in the kitchen, two rooms away. She stepped into the room where he was and said, “Pavlo, not so loud.” When I read this, I started laughing. All my life people have told me, “Please, Borys, not so loud.” I don’t need a microphone. I can address an audience so my voice will be carried to the last row of seats. My grandfather restored the hetman state 150 years after it was abolished. He grew up in Trostianka, Poltava gubernia, where the family owned an estate. There he saw old Cossack weapons and portraits of Ukrainian personalities and hetmans. Do your sons know who you are? Pavlo Skoropadsky: Yes, I told them as soon as I learned the truth. I continue to study my history and that of the second Hetman State, what my grandfather accomplished, what has been written on the subject by Lypynsky and other wise individuals. I am looking for the real reasons behind the quick rise and fall of the second Hetman State. I have realized that it was a genuinely strong and independent Ukrainian state, and that this was why my grandfather instantly found himself confronted by so many enemies. Does this mean you also have enemies? Pavlo Skoropadsky: None of them are left. There are no enemies of the Skoropadskys or those opposing the hetman state left today. Instead, there are people opposed to what can actually benefit Ukraine. Whatever you do, they will always be there to oppose it. Consider the last 100 or 200 years of Ukrainian history. Any more or less unbiased researcher will agree that the second Hetman State was the best period in terms of the economy, science, culture, art, and society. What were the main reasons for the defeat of the Hetman State? Pavlo Skoropadsky: I have given this considerable thought and arrived at the conclusion that the reasons have nothing to do with the economy, politics, or inadequate diplomacy. The Hetman State fell prey to falsehood, treason, and information warfare. My grandfather was an aristocrat, who had a strong sense of duty and code of honor, so all those backstage intrigues and conspiracies were beyond him. Therefore, it is extremely important today to restore the historical truth about Pavlo Skoropadsky and his state. In 1918 he succeeded in uniting Ukraine for seven months. I believe that the truth about the second Hetman State will help unite today’s Ukraine. I see my own calling in learning this historical truth, the way it really is, and conveying it to the people. This is why I came here, to stay forever. There is no denying the merits of Pavlo Skoropadsky in the development of Ukrainian statehood and culture. But history is not a panegyric. For the sake of justice and historical truth, it is worth pointing out certain circumstances that may somewhat alter the excessively complimentary image of the celebrated hetman. Unfortunately, the irrefutable fact remains that Skoropadsky’s regime very heavily leaned on the German occupation authorities’ support. It was no accident that the state stopped existing almost as soon as the German troops left Ukraine. Another fact is the Federation Act proclaimed by Skoropadsky on Nov. 14, 1918, according to which the hetman undertook to unite Ukraine with a future non-Bolshevik government of Russia. So this panegyrical tone is not very appropriate for the discussion about Skoropadsky.